How many ways can we use a 3 or 4 foot long continuous loop of webbing and a carabineer? The list is too long to count but, here are 4 ways we can utilize it. When having to force through a high security padlock the premier tool is the metal cutting K-12 rotary saw. The issue is that the pad lock wonít stay still while the saw is cutting without some intervention. The carabineer can be connected through the top of the shacked and the loop of the webbing and pulled tight so the operator of the saw is able to cleanly cut thru the shackled of the lock and not cause damage. 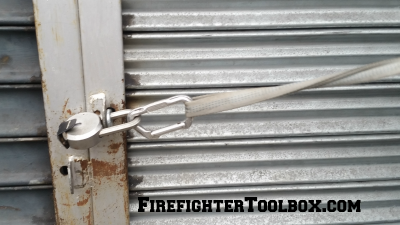 Usually higher security lock both sides of the shackle are secured so both sizes of shackle usually have to be cut. Not many firefighters find themselves carrying a hose strap with them in their turnout gear pockets. But, many do carry a continuous loop of webbing with a carabineer with them. 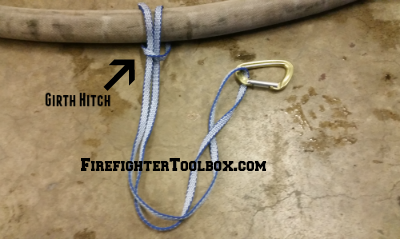 This can be turned into an improvised hose strap when there is a need to secure hose for a vertical hose stretch up an open interior staircase or up the side of a building on fire escapes. 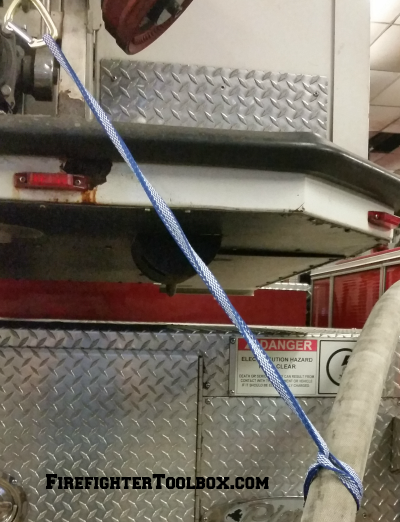 The improvised hose strap can be created by placing the charged hose in a girth hitch and then securing the carabineer to a substantial object. The weight of the hose is taken up by the substantial object. 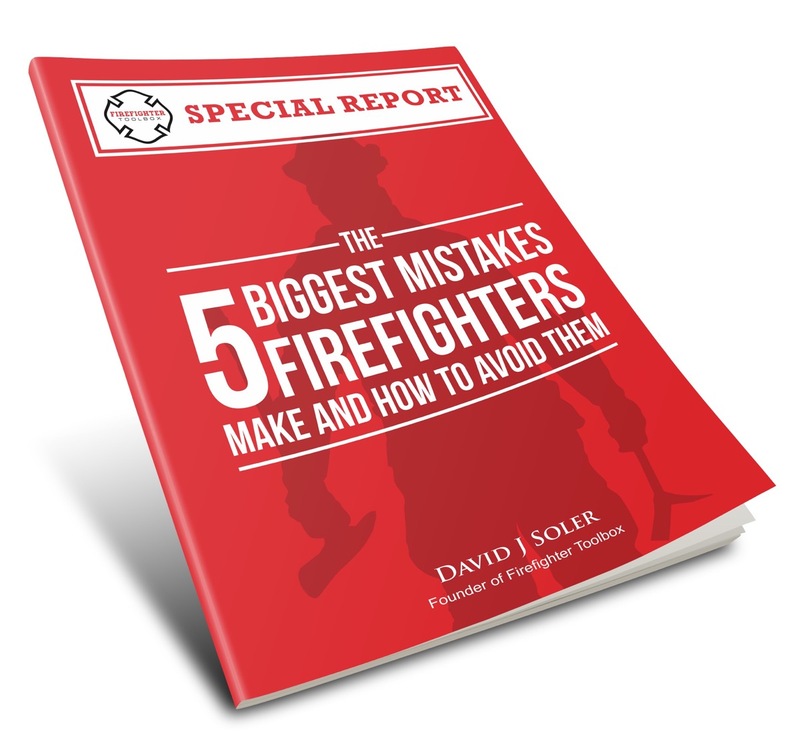 If there is ever a need to move a rapidly on the fire ground it is when a firefighter is down. The webbing creates a great set of handles for the other firefighters to drag the down firefighter to safety. 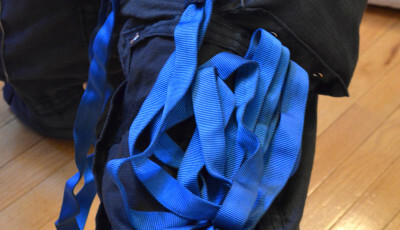 The first step would be to convert the down firefighter’s SCBA waist belt into an improvised harness by connecting it through the legs of the down firefighter. Pass the webbing under the shoulder straps of the SCBA and 2 firefighters can drag the down firefighter to safety. Almost nothing gets our blood pumping more than when there is a call for a pediatric rescue. There is a potential to have several patients at this scene. If we are lucky, it will be the child and the responsible party for the child that need to be cared for. Many times a child, who is naturally curious, will find a way to wedge a body part between 2 objects such as banisters, fences or other objects. We will be called to calm both the child and the adult as well and to free the child without causing further hysteria and damage. We would wrap the webbing directly around the 1 banister or pole that is trapping the child and then take the opposite end of the webbing and place it around the other banisters or pole on the same side, then link them together with the carabineer. We can used a halligan or another similar sized hand tool to twist the webbing around the shaft of the tool taking up tension and slightly pulling the banister or pole to one side creating enough of an opening to free the child. The webbing and carabineer combination is a great tool that is lightweight and has a great impact on fire service operations. Do you carry this tool is your gear?